Mexican queso is chile con queso, and it often misunderstood, confused with the so-called tex-mex dip that’s made by combining canned tomatoes, canned chiles, and Velveeta brand cheese. Even the much quoted Diana Southwood Kennedy admits that she thought Chile Con Queso was not Mexican but from Texas. In fact Mexican Queso is both, because it is Texas Mexican. Southwood Kennedy, being British and arriving in Mexico at age 34, makes the mistake that most Europeans make. They land in Central and Southern Mexico and settle into a preference for those regional cuisines. Northeastern Mexico and Texas (the region of Texas Mexican cuisine) remain largely unknown to most writers of Mexican food. Even in her book, “The Essential Cuisines Of Mexico,” Southwood Kennedy says that she always thought of Chile Con Queso as a Texas dish until she found it to be Mexican because it is a tradition in the Mexican state of Chihuahua. She seems to not understand that Texas and Chihuahua share the same culinary history and flavor profile. 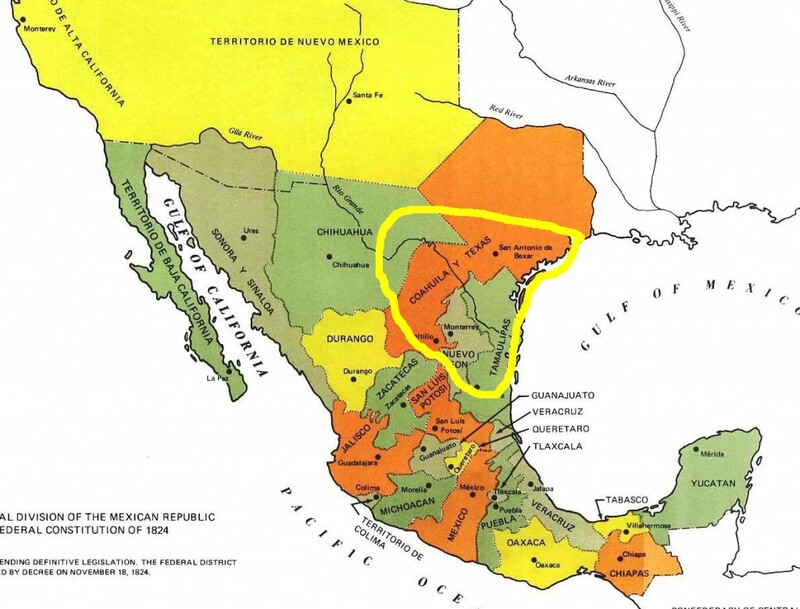 Most food writers are unaware of the history of the map below, and thus don’t realize that both Chihuahua and Texas were claimed as part of the Republic of Mexico until the United States took possession in 1848 at the end of the U.S.-Mexico war. The triangle shows the region of Texas Mexican food, with the Rio Grande as a river running through it. The region was homogeneous, in geopolitical terms, and now that the Rio Grande is also a border, it continues to be homogeneous in culinary terms. Although some of my friends make the newer Velveeta brand, canned chiles tex-mex version, it’s not to be confused with this recipe. The main difference between the two is the focus on chiles. This recipe foregrounds Poblano chiles, tomatoes and onion, the classic Mexican trinity of ingredients. The creamy cheese holds it together, so sublime. It’s not that I reject velveeta brand cheese with canned chiles. I just don’t like for the original Mexican queso to be erased from our party traditions. 3 tablespoons crema mexicana (If you cannot find crema mexicana, you can substitute crème fraîche). 1. 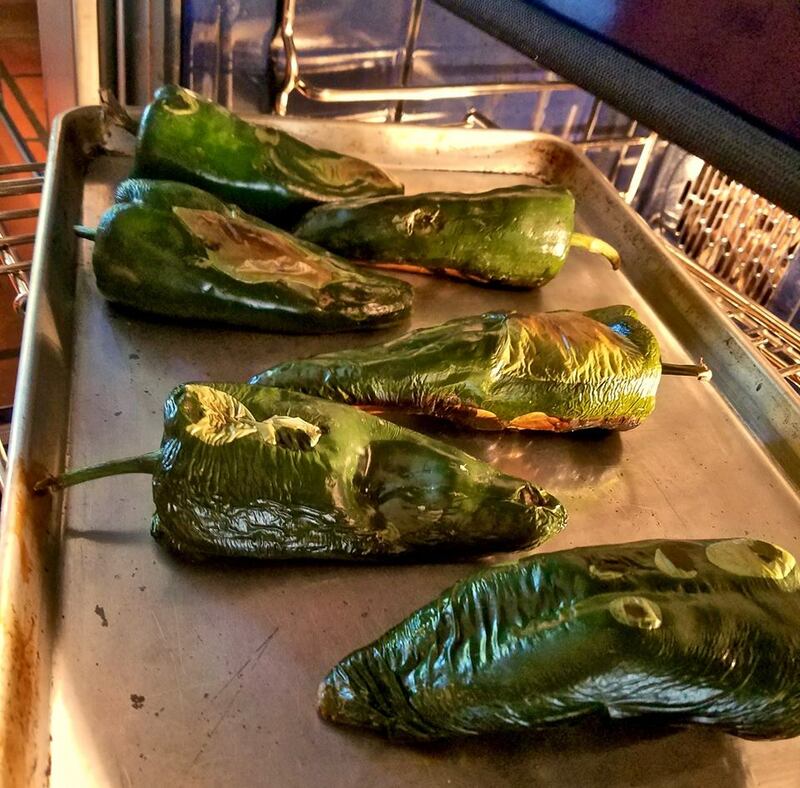 Place the chiles under a broiler, turning them so that they are entirely charred and the skin is blistered. Place them in a paper bag, close tightly, and let them sweat for 15 minutes so that the skin will be easier to peel off. 2. Place each chile on a cutting board and peel off the skin with your fingers. You can use a butter knife if you need to gently scrape off some of the skin, but this should not be necessary if the chiles are well charred. 5. Heat the oil in a skillet, medium heat, and add the thinly sliced onions. Cook them slowly until they are transparent but still completely white with no brown or golden color. Add the diced tomatoes, poblano strips, salt, and cook for 3 minutes. Then turn the heat to low. 6. 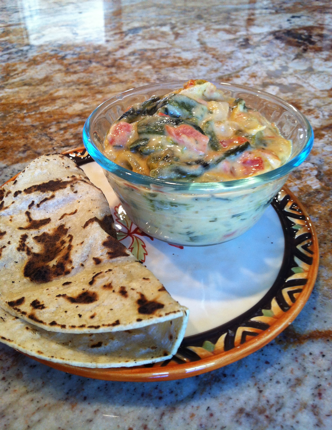 In a cup or small bowl, whisk together the milk and the crema mexicana, pour into the chile mixture, and blend. Turn off the heat. Add the cheese, blend it, and allow it to melt. Adjust the salt. Serve immediately with heated store-bought tortillas, or you can make them fresh, using this recipe for corn tortillas or AP flour tortillas.